And there we are, featuring another enduro style motorcycles!! Just like almost all other makes, Honda too is investing in this market! 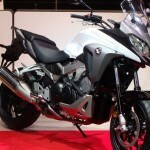 Honda introduced their Crossrunner, a bike that will be a mix between a road bike, roadster and a trail, in 2011! Strangely enough, this bike hasn’t done the success the makers predicted but it is believed to be cause of the lack of response from the engine, comfort & protection! Also, with an 800 engine, not being a small engine but neither too big, this was thought to be quite in demand! 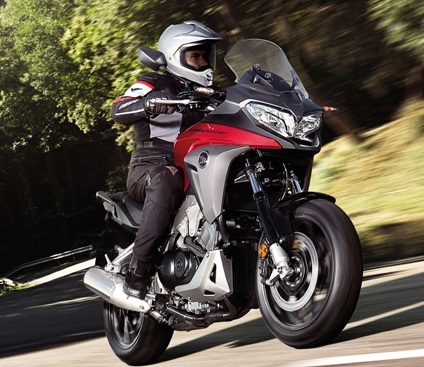 Honda pointed out the weaknesses and have now came up with a new model for 2015, hoping to correct all the mistakes that was done on the present model! To start with, to make this model even more attractive, they started by redesigning the look!! From the 1st photos that emerged, the look surely make its impact …. new front dual lamp, redesigned frame & swing arm. 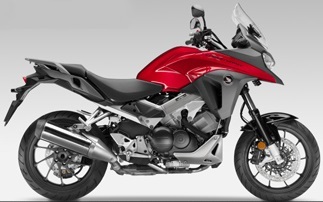 Taking its sister engine of the VFR, the new 2015 honda crossrunner will come up with the V4 800 V-Tec engine! This new engine, the V4 (V type) will give this crossrunner more torque! 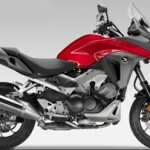 Traction control will be standard and ABS will come with the combined ABS version … this will make this model in line with most of the other Honda models and also help in controlling the weight and, surely costs 🙂 This new model will also come up with more clearance of suspension, 25-28mm! Contrary to the traditional 3 piston calipers, this model will go for a 4 piston one as usually mounted on the Honda sports bikes! Using this system, they’re now emphasizing on the quality of braking at certain speeds! This confirms that Honda are still with the aim to leave a good mix for this enduro style bike to enjoy a sporty ride too! 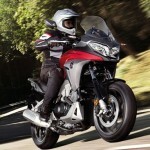 Honda has always kept in mind those who likes these kind of bikes but who have bit of a short legs. Well, not with the Transalp though 😉 Remember, I bought the Transalp from a guy who happened to have short legs and was so comfortable and safe for him to ride it! Good for me as had it practically new but with a 2nd hand price 😉 This CrossRunner will come with an adjustable saddle height!! Seems like that special care has been taken on the handles, riding position, wind break while keeping in mind those who wish to use this motorcyle for long distance travel!! Last thing to point out too is the neater appearance of the silencer, it as now in a lower position compared that to the present CrossRunner. Available around December 2015, this model will be available in black, red & white! By the time this article will be shared with you we’re hoping that there will also be an idea of the price this model will be available for! !